Years ago, the previous team with whom I worked built a theme tailored for a live event. Once the event was over, we refactored a bit of the code and began selling it. When 8BIT folded, one of the previous team members took it over and has been selling and supporting it. The theme has continued to sell well for the past few years. So much so that a couple of years ago, Eric approached me about building out the next version of the theme. So, starting from scratch and using newer technologies, that’s what we began to do. But as our businesses changed and the demands on our time changed, the focus on Live Theme changed, as well. The short of it? We’re looking to sell the theme. 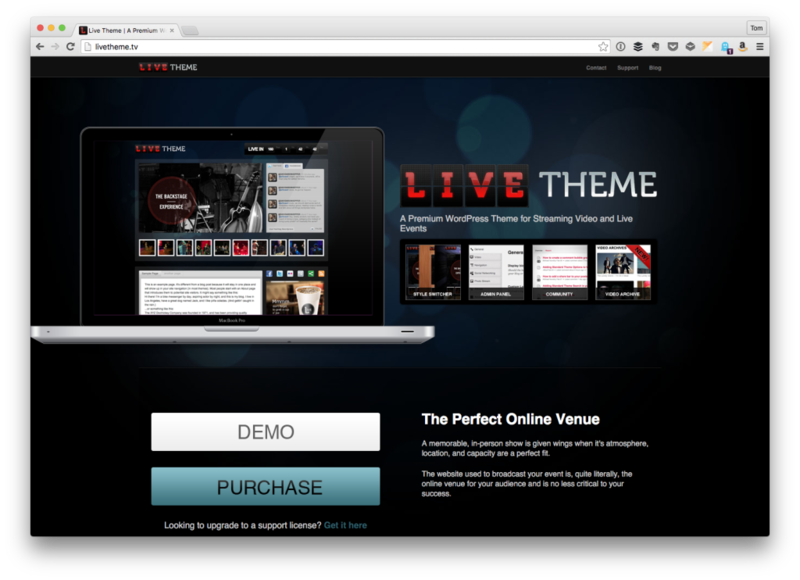 Interested in Purchasing Live Theme? As you’ve surmised from the introduction to this post, we’re looking to sell Live Theme. A memorable, in-person show is given wings when it’s atmosphere, location, and capacity are a perfect fit. The website used to broadcast your event is, quite literally, the online venue for your audience and is no less critical to your success. The current version of the theme looks good and works well, but it’s not without faults. Case in point: It doesn’t conform to many of the modern WordPress best practices and standards. But there’s a brand new version that’s been in development for sometime. It has an updated design, much improved codebase, and uses newer technologies. Additionally, the entire theme as it stands right now is in a GitHub repository. It’s complete with a short list of the outstanding issues. This includes feedback from the customer base and beta testers. The customers are aware of this shift so there are no surprises. And all involvement from current parties will stop. Discussions for the sale price, the code base, and more will be shared with the buyer. Comments on this post are closed as we’d like to keep these discussions in email with serious buyers only. If you’re interest in purchasing a Live Theme, the support desk, and the source code for the latest version, then please let me know via email. Eric, the product owner, and I are more than happy to talk with you about the state of the theme, support, and the outstanding code base. Ultimately, we’re looking for someone who’s passionate about theme development. We’re also looking for someone who likes using WordPress in unique ways. Comments are closed on this post. Please email me if you're interested. Previous PostPrevious What is WordPress kses?